Astronomers from Europe , using the Very Large Telescope in Chile, have for the first time demonstrated that a magnetar — an unusual type of neutron star — was formed from a star that started its life with at least 40 times as much mass as the Sun. Up till now, a star as massive as this was expected to evolve into a black hole, not a magnetar. The result presents great challenges to current theories of how stars evolve and raises a fundamental question: just how massive does a star really have to be to become a black hole? The magnetar in question was found in the extraordinary star cluster known as Westerlund 1, located 16 000 light-years away in the southern constellation of Ara (the Altar). Westerlund 1 is the closest super star cluster known, containing hundreds of very massive stars, some shining with a brilliance of almost one million suns and some two thousand times the diameter of the Sun (as large as the orbit of Saturn). "If the Sun were located at the heart of this remarkable cluster, our night sky would be full of hundreds of stars as bright as the full Moon," says Ben Ritchie, lead author of the paper reporting these results. A magnetar is a type of neutron star with an incredibly strong magnetic field — a million billion times stronger than that of the Earth. They are formed when a certain type of star undergoes a supernova explosion: the outer layers get blown away and the core collapses into a rapidly spinning ball of ultra-dense neutrons. 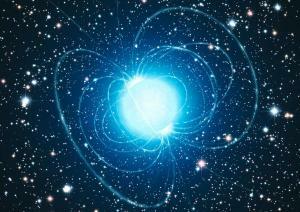 The Westerlund 1 cluster hosts one of the few magnetars known in the Milky Way. Thanks to its home in the cluster, the astronomers were able to make the remarkable deduction that this magnetar must have formed from a star at least 40 times as massive as the Sun. As all the stars in Westerlund 1 have the same age, the star that exploded and left a magnetar remnant must have had a shorter life than the surviving stars in the cluster. "Because the lifespan of a star is directly linked to its mass — the heavier a star, the shorter its life — if we can measure the mass of any one surviving star, we know for sure that the shorter-lived star that became the magnetar must have been even more massive," says co-author and team leader Simon Clark. "This is of great significance since there is no accepted theory for how such extremely magnetic objects are formed." "These stars must get rid of more than nine tenths of their mass before exploding as a supernova, or they would otherwise have created a black hole instead," says co-author Ignacio Negueruela. "Such huge mass losses before the explosion present great challenges to current theories of stellar evolution." "This therefore raises the thorny question of just how massive a star has to be to collapse to form a black hole if stars over 40 times as heavy as our Sun cannot manage this feat," concludes co-author Norbert Langer. "If this is the case it suggests that binary systems may play a key role in stellar evolution by driving mass loss — the ultimate cosmic 'diet plan' for heavyweight stars, which shifts over 95% of their initial mass," concludes Clark. The open cluster Westerlund 1 was discovered in 1961 from Australia by Swedish astronomer Bengt Westerlund, who later moved from there to become ESO Director in Chile (1970-74). This cluster is behind a huge interstellar cloud of gas and dust, which blocks most of its visible light. The dimming factor is more than 100 000, and this is why it has taken so long to uncover the true nature of this particular cluster. Westerlund 1 is a unique natural laboratory for the study of extreme stellar physics, helping astronomers to find out how the most massive stars in our Milky Way live and die. From their observations, the astronomers conclude that this extreme cluster most probably contains no less than 100 000 times the mass of the Sun, and all of its stars are located within a region less than 6 light-years across. Westerlund 1 thus appears to be the most massive compact young cluster yet identified in the Milky Way galaxy. All stars so far analysed in Westerlund 1 have masses at least 30-40 times that of the Sun. Because such stars have a rather short life — astronomically speaking — Westerlund 1 must be very young. The astronomers determine an age somewhere between 3.5 and 5 million years. So, Westerlund 1 is clearly a "newborn" cluster in our galaxy.